John Kirkhope is a solicitor and Notary Public who has long studied Cornish law and has been examining the very mysterious and complex Duchy of Cornwall and their latter claims of ‘private estate’. So says Kevin Cahill, a House of Lords scholar and researcher with no Cornish nationalist axe to grind. “Cornwall really is a separate kingdom, as has long been claimed by activists west ot the Tamar.” so says Martin Hesp, a Western Morning News journo with no Cornish nationalist axe to grind. So what the hell is going on? Well, Mr Cahill has published a facsimile of an old manuscript known as the ‘Second Domesday’ or more correctly, ‘Return of Owners of Land, 1873’. This dusty tome shows who owns what in Britain and as we in Cornwall have known for a long time, you don’t own squat. Talking to people in my job, they are always amazed when I mention the Duke of Cornwall owning everything in Cornwall; the land, the trees, the leaves on the trees, your house (or at least the land it stands on) etc. Across the border in merrie England, it’s the Crown. 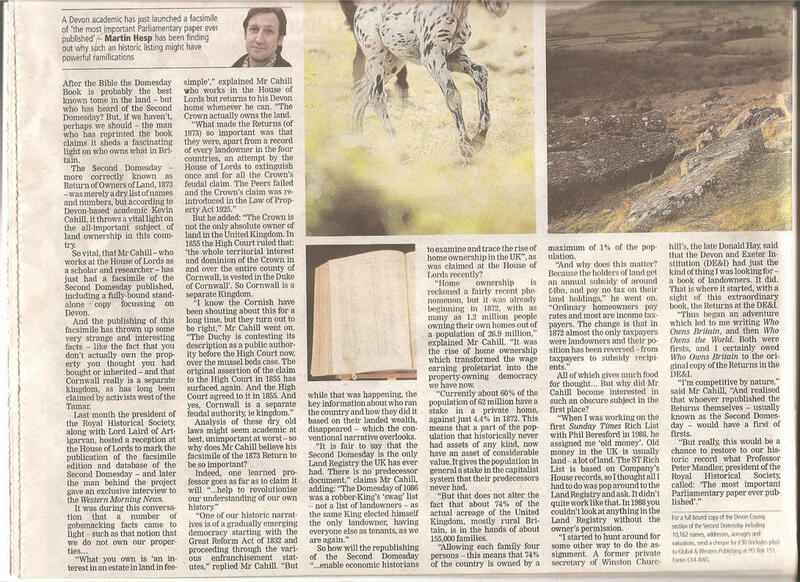 So here is a scan of the article that appeared in the WMN. You can’t find it online as they (WMN) haven’t deemed it worthy of putting up. Well, we wouldn’t want the populous to know the truth now, would we? It’s a wonder this article was ever printed at all but it was and it boosts Cornwall’s cause no end.